The following presentation is well overdue. 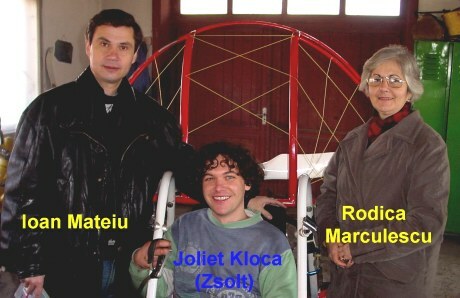 During my last visit in Romania (December 2004) my good friend Ioan Mateiu who is a Romanian PPG Vice-champion and a very experienced GA pilot, introduced me to a young and talented man: Zsolt Klocza from Targu Mures, my home town. Zsolt 28, is well known in the Romanian flying community for his various aviation related projects. I will present his latest construction. When I entered his garage, which now is a real workshop, I was amazed by the multitude of projects I saw there. Zsolt flies since 1995. He has many "free flight" hours under his belt and also flies PPG trikes and delta trikes. 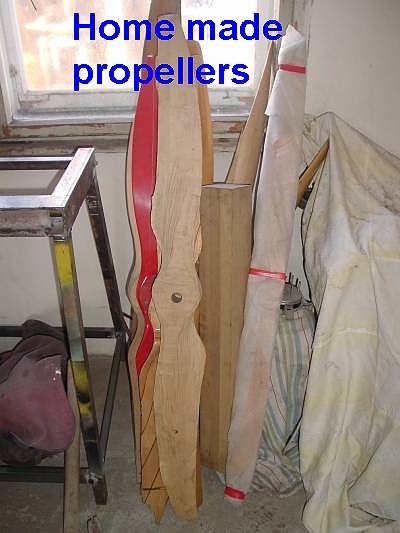 The project which I am about to present is an entirely home made PPG trike. The machine is equipped with a German MZ 250 cc motorcycle engine which develops 18 HP. The engine was modified by him. 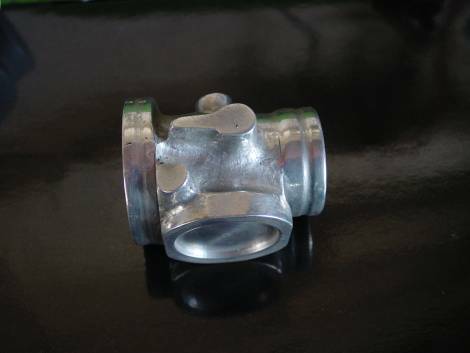 The cylinder head was taken from a Trabant car and adapted to the MZ 250 cc engine. 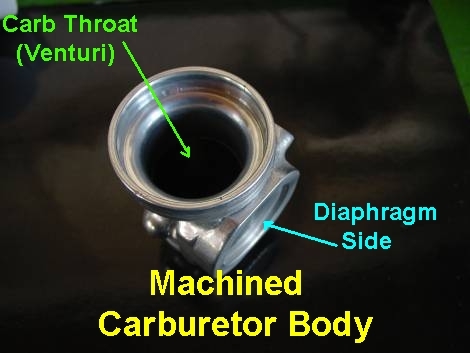 The engine has an increased compression achieved by machining the cylinder and head. 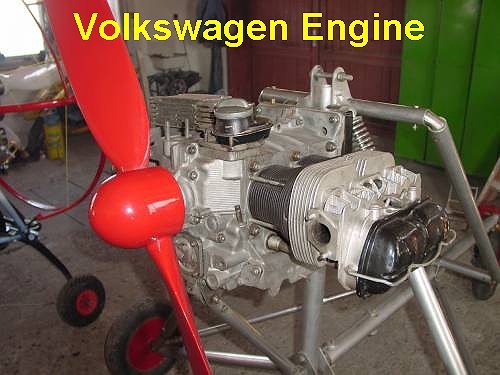 The tuned pipe and muffler were calculated and made by Zsolt as well as the carburetor and propeller. 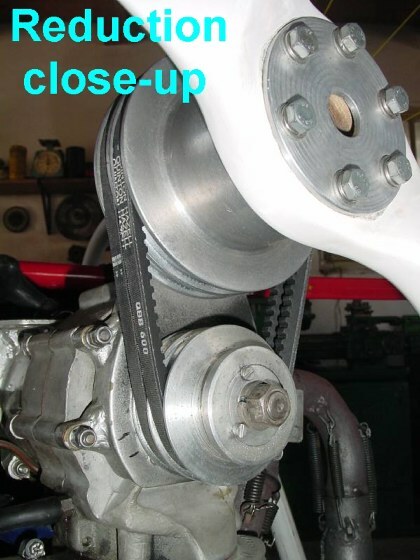 The reduction is a belt driven system with a 1:1,8 ratio. The max RPM of the engine is 5,500. 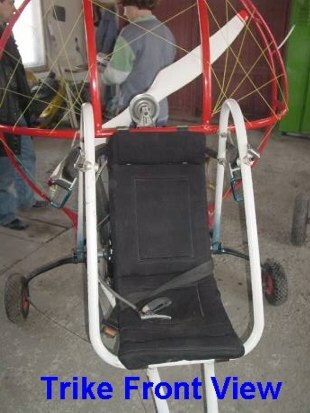 With the Perche Sonic paraglider, the machine can climb at 2,5 m/second or better. The picture below shows the trike from the front. The harness/seat is also home made. 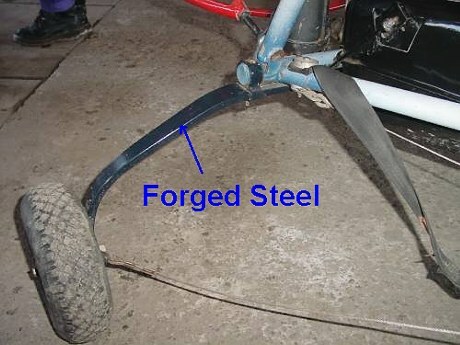 The landing gear is made of forged steel and the wheels belonged to a cart. 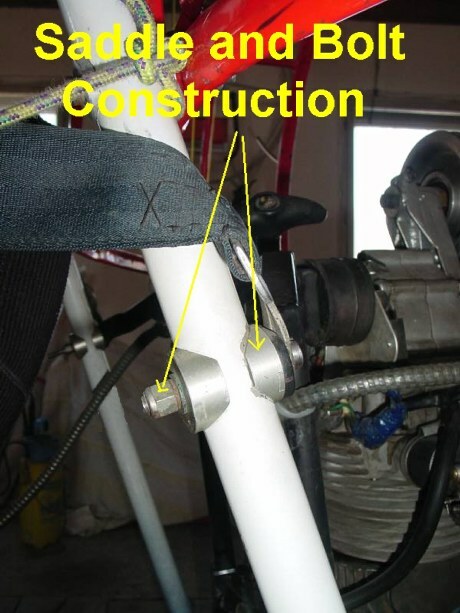 The whole machine uses the "Saddle and Bolt" construction so common in ultralight aviation. 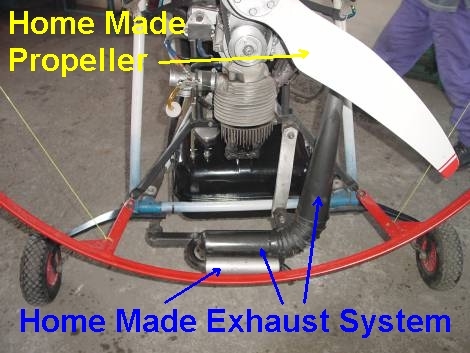 A similar system is used by Jeff Baumgartner on his home built paramotor. The home made reduction needs another close look. 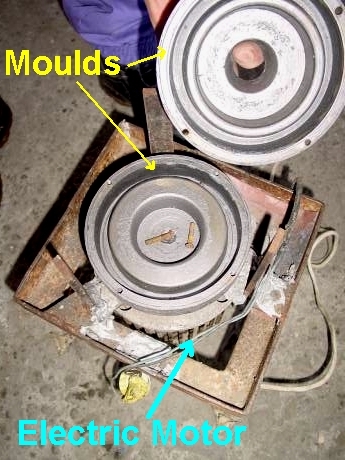 Both pulleys were cast by Zsolt in his own ........ garage!! 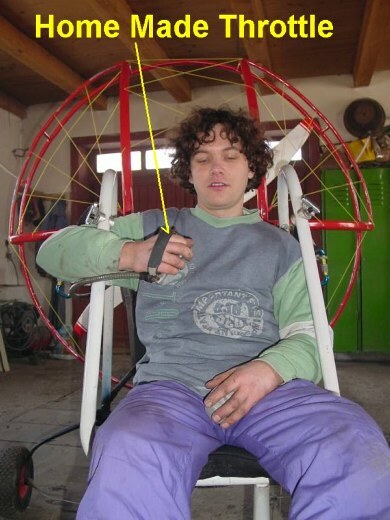 In order to make sure that the pulleys do not have any weak points inside (air) Zsolt developed his own centrifuge. 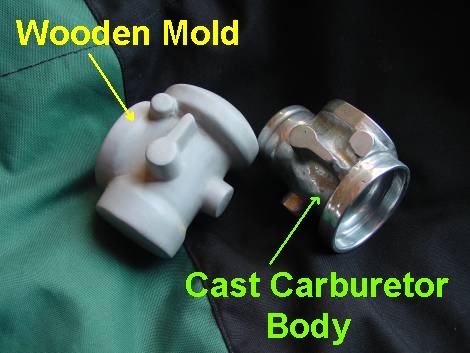 The moulds rotate while the molten Aluminum alloy is poured in them!! The gas tank is metal and was "borrowed" from a Trabant car made in the old East Germany! 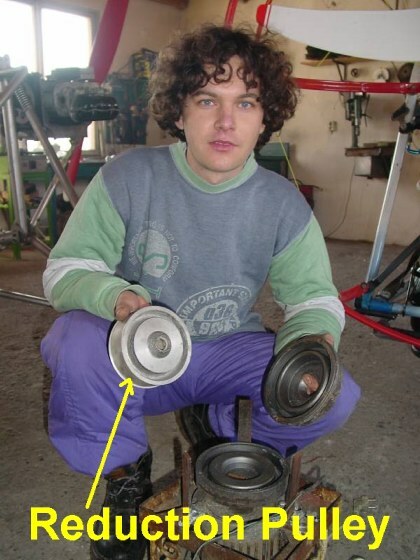 Zsolt tried different membrane carburetors but for this engine none worked too well. So, another project started: building a home made carburetor!! 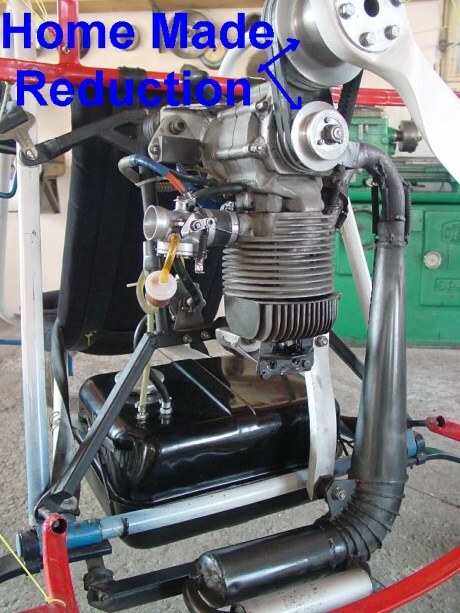 Zsolt designed a membrane carburetor based on real calculations. 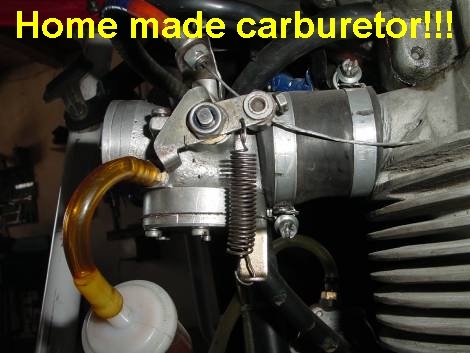 Here is another close-up of the home made carburetor already installed on the engine. 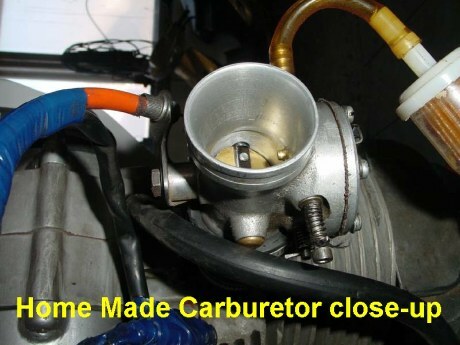 This carburetor gives the engine a very smooth run in the whole RPM range!! 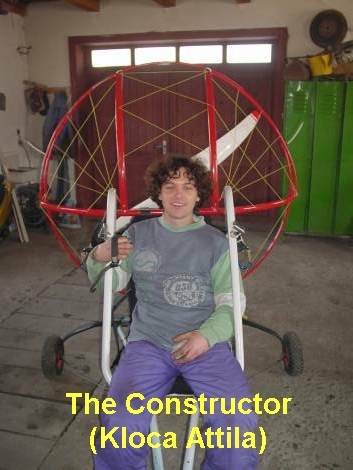 Next, Zsolt amazed me again: when I asked about the origin of the very nice white propeller he had on his machine, with a very humble voice he said: "I made it myself"
The cage of the machine is made from helicopter steel tubes and has an incredible strength. Zsolt is not "done" with his inventions. In the picture below, he shows Ioan Mateiu what he wants to build next. I hope that during my next visit in Romania (September 2005) I will have the pleasure to take some pictures of this new project. there are many talented amateur constructors in the World. Their minds constantly work hard to build new projects or improve existing ones. It is a shame that the vast majority of these people is unknown for most of us. This is why The Inventions Page was started. One last thought: it is also a shame that existing manufacturers, do not incorporate ideas from so many talented amateur builders. Finally, I would like to thank Ioan Mateiu and Zsolt Kloca for their help to bring this project to public attention. 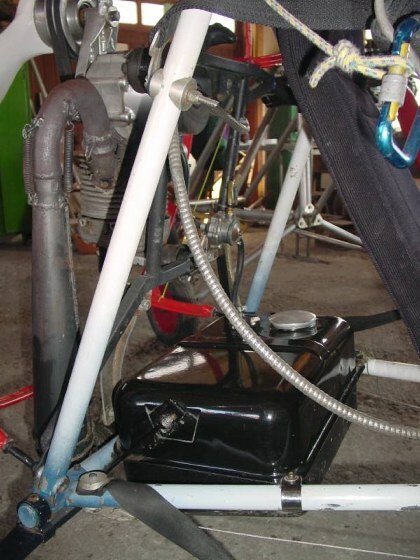 It is a tandem PPG trike with a big Simonini engine on it. I hope to have the opportunity to write a report about it while visiting in Romania.